The art of storytelling through comics is a complicated beast. Unlike many other formats, comics require a seamless blend between frames that are inherently separated with bold, crisp lines. They require a powerful story to push the reader from panel to panel and images so alive that they move in the mind’s eye of the reader. 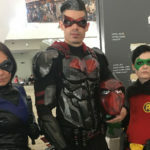 This is no easy task, yet Baltimore Comic Con sought to give enthusiasts an insight into the process through various storytelling panels. 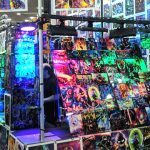 As a writer myself, I was fascinated to glimpse this world through back to back panels. Full of coffee and creative energy, I began my Saturday at Baltimore Comic Con with “Story Structure,” and it did not disappoint. With a lineup of 5 comic storytellers and one moderator, the excitement was tangible even among the panelists. I sat towards the back, watching as moderator Robert Greenberger chatted easily with Marv Wolfman (The Tomb of Dracula, The New Teen Titans), James Tynion IV (Detective Comics, Batman Eternal), Mark Waid (The Flash, Captain America), Louise Simonson (New Mutants, Superman: The Man of Steel), and Elliot S. Maggin (Action Comics, Superman). The group settled, the audience attentive in their seats, and the panel got moving. Greenberger provided effortless moderation with relevant questions and little hesitation, although the panelists themselves had some difficulty finding the flow between them at the start. 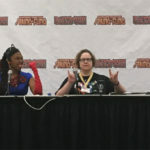 Waid, with biting intellectual humor, dominated the questions; however, Wolfman easily interjected with well-formulated thoughts underscored by deliberate gestures. This pattern was quickly broken as we dove deeper into the finesse of story-telling, with all panelists agreeing and rebutting the assertions of their peers in turn. By the time Greenberger began asking about writing ensemble comics, the writers were an ensemble in themselves. “Story Structure” panelists pose for photos following the event. 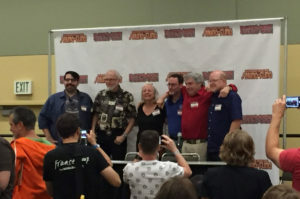 Left to right: James Tynion IV, Marv Wolfman, Louise Simonson, Robert Greenberger, Elliot S. Maggin, and Mark Waid. The questions Greenberger put forward spanned a good range of challenges for new writers, and because of that generated a thoughtful conversation. Simonson was always ready to address questions about character development, proffering each answer with animated gestures and a pop-and-fizzle demeanor. Tynion, with a somewhat awkward and reserved delivery, nevertheless broke down his creative processes in detail. Though his answers were frequently long-winded and laregly uninterrupted by Greenberger, he provided insight into a methodical approach to writing. Maggin largely listened to the flow of conversation; however, when Greenberger queried the writers about experiences with editors, Waid mentioned a story of Maggin’s, side stepping to yield the floor. Maggin laughed, shaking his head, and opened up with a conversational tone that easily invited the audience into his world. This panel felt largely like barely controlled chaos, but had the spirit of creative genius which infused both the panelists and the audience, especially as Greenberger segued into audience questions. As the panelists responded the audience internalized this energy, turning to their friends to laugh and share ideas much like the panelists did themselves. Overall this panel held the spark of creative endeavor that, specific questions aside, can set any writer on a path to make something amazing. Carrying that buzz that left me more energized than my 20-oz. coffee, I walked to the next panel: Inside the Art of Visual Storytelling. 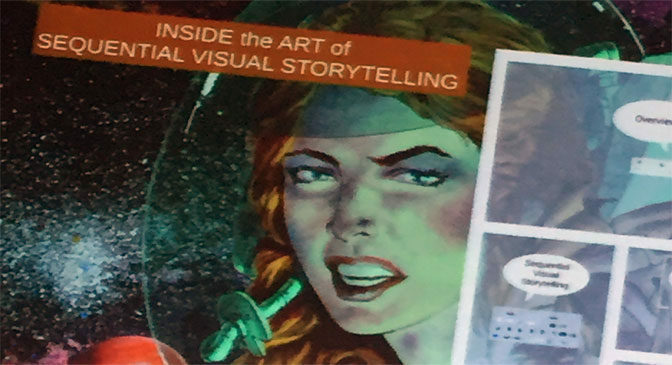 Presented by Carl Potts (Marvel Entertainment Executive Editor, screenwriter and author of The DC Comics Guide to Creating Comics: Inside the Art of Visual Storytelling), this panel promised to cross examine the interplay between emotional instinct and intellectual approach in comic artistry. Upon arrival, however, it became fairly clear that the emphasis would remain on the methodical aspects. The room, with only a handful of participants, had a subdued energy easily overwhelmed by the exciting image broadcast on the projector screen. 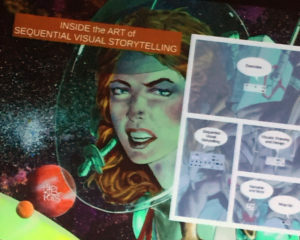 Even this spark was lost as Potts transitioned into his slides, on which even the comic visual aids became little more than footnote figures to bullet points. As the presentation progressed, Potts shook out some of the nerves and monotonous tone which originally hallmarked his speaking style. As he loosened up the talk became more dynamic, flowing more easily from slide to slide in a way that comics should flow easily from panel to panel. The passionate energy I expected from Potts, given his resume, was lacking; he was able to partially make up for it, however, with step-by-step guidance that would genuinely assist an aspiring comic artist. While I did not get the same inspirational energy from this panel as the one previous, it was nonetheless informative and insightful. Unlike a successful comic, these panels did not move seamlessly from the first panel to the second. The first crackled with movement and energy but occasionally lacked focus or clear direction. The second missed that passion, but gave attendees valuable tools that could be used in a budding career. Overall, these panels built off each other much as the artist and writer compound to tell the story in a comic. While I was left wanting to learn more, together these panels gave me a successful introductory glimpse into the world of comic storytelling.